Transport for London’s (TfL) second Annual Advertising Report (2017/18) has revealed the growing success of its advertising estate, with more than £150m in revenue generated during the year for investment back into improving the transport network. The report highlights how TfL is continuously improving its estate with the introduction of innovative advertising platforms and illustrates how TfL is collaborating even more creatively with advertisers. In 2017/2018, more than 16,000 advertisements ran on the TfL network, generating approximately £152m – £10m more than the £142m raised in 2016/2017. As part of TfL’s new growth strategy, advertising is one of the key ways that it is making the most of commercial opportunities and building revenue. TfL’s advertising estate accounts for 20 per cent of the UK’s, and 40 per cent of London’s, outdoor advertising by value. With its Tube, rail, bus and road network supporting approximately 31 million journeys every day, advertising on the transport network reaches one of the most diverse, valuable and engaged audiences in the world. To improve opportunities for advertising, TfL has introduced 260 new full-motion screens across the London Underground network and 60 full-motion ‘cross platform’ screens, which customers can watch when standing on station platforms. Outside of the Tube and rail network, TfL has installed 12 large digital landscape advertising screens at six key locations along London’s main arterial roads. 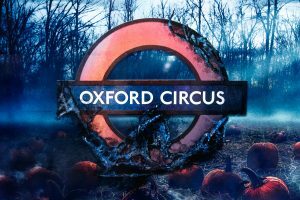 The start of 2019 has also seen the first advertising campaigns going live on new digital ‘ribbons’ at Tottenham Court Road, Piccadilly Circus and King’s Cross St. Pancras Tube stations. 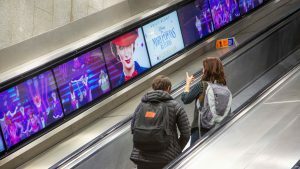 Each consists of several aligned digital screens alongside escalators enabling an advertising campaign to seamlessly flow along the length of the escalator. 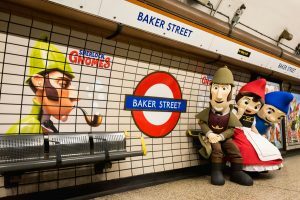 Advertisers have also been taking advantage of the experiential advertising opportunities offered by TfL’s estate, from brands such as Netflix covering the walls and ceilings at Oxford Circus and Old Street Tube stations for their Black Mirror and Stranger Things series’, to Baker Street Tube station being taken over by gnomes to celebrate the release of the ‘Sherlock Gnomes’ film. 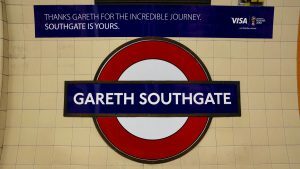 Visa also teamed up with TfL to honour the success of the England national football team at the World Cup in Russia and renamed Piccadilly line station Southgate to Gareth Southgate, gaining global media coverage. Leading advertisers are also using TfL’s new segmentation data to engage its audience on the network. It overlays depersonalised and grouped data from smart ticketing with Experian Mosaic groups to give advertisers more in-depth information about the types of people that use our network. As well as raising revenue, TfL is also supporting the Mayor’s aim to create a healthier, more active London and in particular to tackle the problem of childhood obesity in London. Following the results of the consultation on the Mayor’s draft London Food strategy, it was confirmed that, from 25 February 2019, there will be restrictions on advertising food that is high in fat, salt or sugar on the TfL network. TfL is now working with advertisers to ensure they understand what adverts will be allowed when these restrictions take effect. The Annual Advertising Report and more information about advertising on the TfL network, including the TfL Advertising Policy, can be found here.